When a nation sends its citizens to war, there are few things more important than providing the best treatment possible after they get injured in the line of duty. Thankfully, combat medicine has responded and evolved, steadily improving the survival chances of those injured on the battlefield. Top Image: Capt. Billie Matthews, Spc. Lauren Bentley and Spc. Sean Whisner check vital signs on Capt. Nicole Bettinger, a “mock patient” during a mass casualty exercise in the emergency medical treatment area at the 28th Combat Support Hospital. The EMT carries the same equipment as a civilian emergency room but is designed for airdrop capabilities. Photo courtesy Dawn Elizabeth Pandoliano/Army.mil. U.S. soldiers, Marines, sailors and airmen have now endured longer than a decade of conflict, which has provided the anvil to shape military surgeons’ expertise in treating critical damage to the human body. And by most accounts, combat medicine has responded and evolved, steadily improving the survival chances of those injured on the battlefield. Wars in Iraq and Afghanistan have once again proven the adage that necessity breeds invention, and the medical system of the armed forces is saving troops who would otherwise have died. Col. Blackbourne, thanks for speaking with us. We hear people mention that survival rates have been climbing for those wounded in combat in recent years. What do the numbers say? If you look back at World War II, 75 percent of the wounded would survive. In Vietnam, we got that number up to 84 percent. Today, if you’re wounded in combat, there is a 90 percent chance you will survive. Studies of those who were killed in action on the battlefield versus those who died of their wounds later at a treatment facility actually show an uptick in deaths after they reach advanced care providers in the recent conflicts compared to previous ones. What does this mean? Much of the overall survival improvement comes from people wearing effective body armor, quicker evacuation of the wounded from the battlefield and better hemorrhage [profuse blood loss] control. But because of those battlefield improvements, the geography of death has changed. Now we’re getting sicker and sicker patients coming to the medical treatment facility. Fifty percent of those who die from their wounds lose their vital signs prehospital or when they get to the emergency room. Here’s another number: 90 percent of combat wounded who end up dying do so before they get to a surgeon. Of those, we estimate that 25 percent are suffering from potentially survivable injuries. What do you see as the big trauma breakthrough coming from the last decade? We call it damage control resuscitation and surgery. The name comes from the Navy—after a ship gets hit by a torpedo, you need to control the damage. You don’t care if it’s pretty; you just care about not sinking. The object is to keep people from dying by controlling the bleeding so they can get to a surgeon who can do more advanced things. Since the Trojan War, when someone got injured on the battlefield, cloth bandages have been used to control the bleeding. Until 2001—now we have hemostatic agents that control it much faster. We use combat gauze that’s impregnated with coagulants. So we have ways to stop bleeding that we never had before, and in the hospital, more ways to resuscitate people. It’s all about blood loss. The average man has about five liters of blood; lose about half of that and some people start to die. It’s not that much blood really, just two and a half liters. Have you learned anything surprising about blood loss when you get people into these extreme injury situations? Over the last 10 years, we realized when you start losing a lot of blood something starts happening that doesn’t make any sense, really. Your body actually stops making coagulants—it stops making the stuff that clots your blood. We don’t know why that is, but today we give clotting factors and platelets, where before we just gave red blood cells. Data from Iraq really revolutionized treatment of trauma patients in giving those clotting factors. We knew about it in World War II, but we forgot about it. I guess you could say it’s a benefit of war that we learn these new things about treating major trauma. It seems counterintuitive that the human body would stop clotting just at the point when it needs to do that the most. Have any other unexpected facts like this come to light recently? On the battlefield, it’s all about stopping the bleeding and keeping blood volume up. We used to train medics in the ABCs—airway, breathing, circulation—as the steps to stabilize to keep someone alive. Now we’ve changed it to CAB. Circulation first. Stop the bleeding. Then make sure the airway is clear, then breathing, because it’s all about hemorrhage control if we want to impact mortality. We also realized when you had someone come in with major blood loss—something we call exsanguination— and weak vital signs, we didn’t want to bring their blood pressure back up to normal. If you bring their blood pressure up too high you “pop the clot.” It’s like putting a hole in a bucket and putting a cork in the hole. If you overfill that bucket, the plug can pop out. We found that for otherwise healthy young people, you don’t need to bring them up to more than 90 systolic blood pressure, except if they have a brain injury. You have written that, “Hemorrhage remains the greatest threat to life on the battlefield, accounting for half of all deaths.” And in the journal Trauma, you and your colleagues found that blood loss causes up to 87 percent of potentially survivable injuries. What’s more, 50 percent of those blood loss deaths result from penetration injuries to patients’ trunks—the main part of their body apart from their limbs and head. Have any inroads been made to control those types of wounds since medics and doctors otherwise have a hard time applying enough compression? We came across a clamp that was created by Joseph Lister [of Listerine fame] 150 years ago that he called an abdominal tourniquet. You can use it on parts of the body where you can’t apply a tourniquet but you need compression to stop hemorrhaging. Now, we’ve got three FDA-approved clamps like this that increase the anatomical geography available for compression. They’re called CRoCs [combat-ready clamps]. That, plus the tourniquet technology that we’ve had for over 300 years, represent some of the few things we know save lives on the battlefield. All of these tourniquets are the biggest things, along with the combat gauze and what we now know about packing patients with clotting factors to keep them alive. We’ve shown that tourniquets are safe and life saving. In fact, civilians are starting to use them, too. It’s a reversible treatment. It’s the number one thing we use prehospital to save lives. What types of technological breakthroughs are still needed to improve combat injury survivability? We need to develop remote presence, where you can have a doctor or physician’s assistant virtually in the field with a medic looking at what needs to be done. With a remote doctor looking at a person’s vital signs and injuries, they can guide the medic. It’s especially important with the increasing number of pharmaceuticals and tools available to provide supervision. 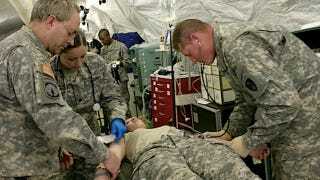 Without it, the medics will get increased pushback from the technologies. Along the same lines, we need to give the medics the capability to take and send ultrasound images back to the doctor from the battlefield. Any deployed ultrasound device would of course need to be small and hardened. It would also be helpful for forward surgical teams to have CT scanners, which they can’t have now because they’re too big. A light, small one would be great. The other thing is a stopper for being shot in the belly. The most important thing is to get you to a surgeon as fast as possible, but we don’t often have that luxury. Will our answer be a compressive device—a balloon in the cavity? We’re also looking at other mechanical means like putting an occlusion in the aorta to stop blood going into the abdomen. We don’t have a single answer for you right now if you get shot in the belly. This article comes courtesy of the Txchnologist, GE's blog about innovation in science and technology.